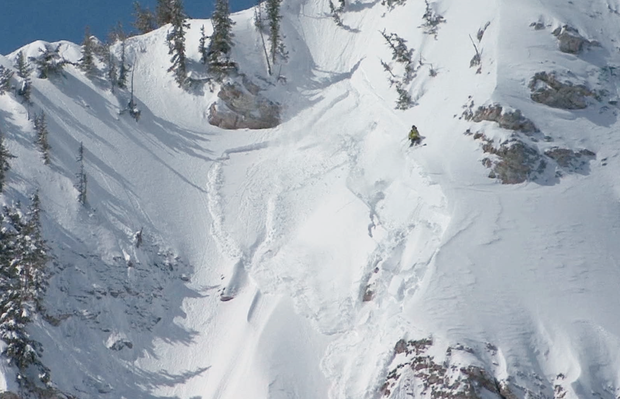 Backcountry Responsibility Objective from Trent Meisenheimer on Vimeo. With the freedom of the hills comes responsibility. Social responsibility in avalanche terrain is critical as backcountry use explodes. Establishing a clear set of expectations and shaping a culture of responsibility around Knowledge, Awareness, and Wisdom is imperative to protect not only ourselves and others...but our continued access into backcountry terrain. Thanks to Trent Meisenheimer, the UAC, TGR, and others for their hard work and support. ARE THESE THE NEW ETHICS OF BACKCOUNTRY TRAVEL? The Utah Avalanche Center is launching a new initiative to create a set of universal backcountry ethics for traveling in avalanche terrain. It comes as a response to increasing numbers of avalanche accidents, which are in part due to the rapid increase of skiers and snowboarders riding in popular backcountry and sidecountry areas throughout North America. When human-triggered avalanches threaten the well-being of others—especially those outside of the party that triggered the slide—there becomes a need to consider the issue of social responsibility in avalanche terrain. This powerful video features shots of epic riding, massive avalanches, and a range of characters who explain the three precepts (knowledge, awareness and wisdom) necessary for the new age of socially-conscious backcountry travelers. Drew Hardesty, a forecaster for the Utah Avalanche Center and the mastermind behind this new program, spoke with TGR to give us more background on the initiative. Was there any single event that stands out as the tipping point for needing a code of ethics in backcountry avalanche terrain? The tipping point for me was in your own backyard [the Teton Pass backcountry]. There was a skier-triggered avalanche 4 years ago on Mt. Taylor that filled up the Coal Creek drainage 20-30 feet deep with debris. Local avalanche pioneer Rod Newcomb termed it "the hundred-year avalanche event." To me, it was only a stroke of luck that 30 people weren’t killed, because people are constantly cruising up that drainage or coming down it from Mt. Glory or other parts of Mt. Taylor. OUR FEARS WERE REALIZED TWO YEARS AGO WHEN IN MISSOULA, MONTANA A BACKCOUNTRY SNOWBOARDER TRIGGERED AN AVALANCHE ON MT. JUMBO THAT CAME ROARING DOWN AND PULLED A HOUSE OFF OF ITS FOUNDATION. After this close call, I looked through the archives and found event after event of very close calls like this; it was not limited to the Teton Range or the Wasatch Range. These near misses had been as far away as the Whistler backcountry, Galena Pass in Idaho, and on highways in Washington State. Our fears were realized two years ago when in Missoula, Montana a backcountry snowboarder triggered an avalanche on Mt. Jumbo that came roaring down and pulled a house off of its foundation. It buried three, including a kid. One eventually died from this incident. So when did this project begin for you? 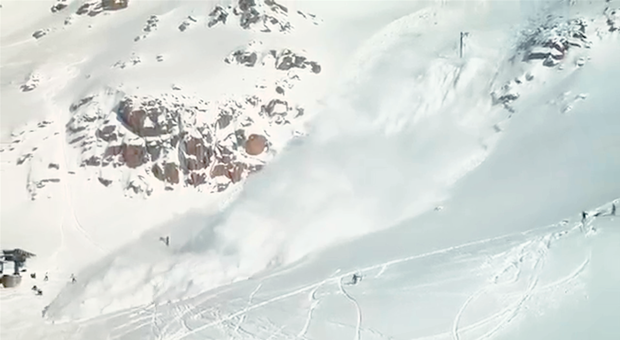 An avalanche rips through a basin in Bariloche, Argentina, taking out unsuspecting skiers and snowboarders in its path. Skinny Skis [a Jackson, Wyoming ski store] has long held avalanche awareness nights up at the Snow King Resort. The organizer of that event invited me up one time to be the keynote speaker. I was going to talk about [avalanche] terrain, but then I thought, this idea of social responsibility in avalanche terrain is the issue of our time. I spoke for an hour and showed photos, videos and case studies, showing that this was an alarming trend we are seeing. We are seeing increased numbers of close calls and accidents in the backcountry. THIS IDEA OF SOCIAL RESPONSIBILITY IN AVALANCHE TERRAIN IS THE ISSUE OF OUR TIME. It’s not the Wild West anymore; we are not out in the backcountry alone anymore. It's something we need to share. [We need to] define and create some sort of ethic of social responsibility, particularly in avalanche terrain, to see us through the future. What can the ski community do to help affect a shift towards increased mindfulness in the backcountry besides watching your awesome videos? 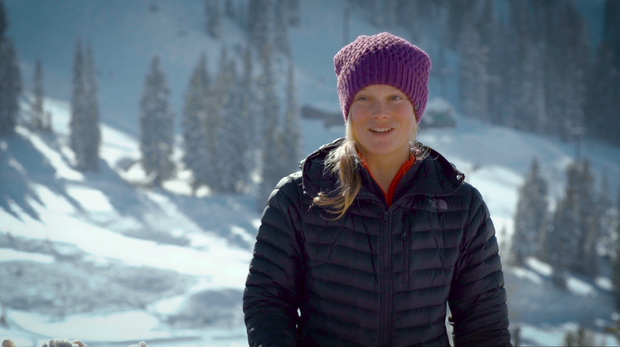 Angel Collinson explains the importance of knowledge in the backcountry. Every backcountry skier must know the avalanche hazards and know how to pull off their own rescue. It’s going to require a cultural shift. Avalanche knowledge used to be this exclusive thing, that was held really tight, but now we need to turn that upside down and bring everyone into the fold, into the tent. We are all stakeholders – ski patrollers, highway forecasters, snowmachiners, skiers, snowboarders – it’s in all of our best interests to create and share backcountry ethics. Leave No Trace [ethics] come to mind. Nobody is going to jail if they drop a candy bar wrapper at the campsite, but our culture is against that. With avalanche safety, if you are part of a group of four and show up at the trailhead without your beacon, shovel and probe, your group will say “Dude, we are not going into the backcountry with you”, even though there is no rule against it. This is now just a basic expectation. We should also let people know what we stand to lose should we not reach towards these ethics. If people couldn’t hike [Teton] Pass any more, they would be really upset. I want to be proactive and not reactionary. In this video you said you hoped “to avoid potential consequences of permanent area closures or backcountry permit systems”. Are these possibilities already being considered in some places? A skier triggers an avalanche and rides away safely. Anyone in the runout zone of this avalanche is now in serious danger because of this rider's actions. Local, state and federal agencies have the responsibility for public safety. If it gets to the point where increased incidents continue to occur in these alarming trends, then they will have no recourse but to institute some sort of administration, protocol or rules. In the worse case, there could be terrain closures. The classic example is up at Roger's Pass [in British Columbia, Canada]. There, you are required to get a permit to go backcountry skiing, [and also must] pass a test, and have the permit on you. The permit says you are aware of the hazards and of the terrain that is permanently closed, terrain that is permanently open and that which may be open or closed. ALL THESE YEARS WE HAVE GONE INTO THE BACKCOUNTRY TO SEEK OUT THESE FREEDOMS, BUT NOW THERE ARE MORE PEOPLE HERE AND WE HAVE TO CHANGE OUR MINDSET. THESE ARE NOT NECESSARILY FREEDOMS, BUT THESE ARE PRIVILEGES THAT WE COULD LOSE. Particularly in places like Teton Pass and Little Cottonwood Canyon, where the road sits in the track of avalanche paths, we are seeing increased numbers of avalanches that are crossing the open road. If these trends continue, I feel that land managers will have no recourse but to close and restrict our access for the safety of the public. All these years we have gone into the backcountry to seek out these freedoms, but now there are more people here and we have to change our mindset. These are not necessarily freedoms but these are privileges that we could lose. Unless we come about and define [backcountry] ethics, then we stand to lose the freedoms and privileges that we have long come to love. You can’t go straight from being a resort skier to having all the knowledge and wisdom for safe backcountry travel. What do you recommend that people do who want to safely gain that experience in popular backcountry areas? It comes down to a community-first perspective, rather than a me-first perspective. This sense of "How do my decisions affect others in the backcountry?" In the olden days, it didn’t matter because you were just out there (alone) in your leather boots and wool knickers. But now, if I am at the top of the ridge and I see twenty people cruising out Coal Creek or if it is a considerable or high avalanche hazard day, maybe I shouldn’t be center-punching Glory Bowl [a large avalanche start zone]. If a school bus full of kids gets knocked off the road because of an avalanche I triggered, this is a serious consequences that the community cannot bare. [To prevent this] it’s just discipline and awareness, which does not take twenty years of walking around in the backcountry to obtain. It’s just asking, "What are the outcomes of this decision I am going to make?" This is increasingly important to ask in this day and age. Mentorship is certainly key, but more so is everyone buying into these ethics, which is to have these few ground rules about traveling in avalanche terrain. In reading your interview in the article "Are These The New Ethics of Backcountry Travel?" with Pyper Dixon, you state: "Particularly in places like Teton Pass and Little Cottonwood Canyon, where the road sits in the track of avalanche paths, we are seeing increased numbers of avalanches that are crossing the open road" and in the blog "Expert Intuition and the Avalanche Problem" you advise: "At this point, it's instructive to look at our Utah stats since 1940. ", in regards to which type of avalanches are responsible for our fatalities. I am wondering if we can, in a sense, combine the same data search in seeking out the backcountry user triggered avalanches that are crossing the open road (s). What type of avalanches and locations may be welcome info. I have a hunch, with spring sadly approaching, that wet slides might account for the most backcountry user triggered slides that cross the road(s)...hmmm...or is it new storm snow slides?? -- I recall being late on west facing patsy, I guess,... "microwave"... kicking off wet roller balls that surprisingly gained size which then slowly and deliberately flushed a gully and being so worried that it would hit the summer road and potentially harm someone. (luckily it lost strength and petered out) Whelp, maybe some data gathering delegation for the grunt intern....Thanks so much for all your excellent forecasting, writing and commentary!!!! I haven't seen any mention of the fact that there are parties ascending the south face of Superior on almost a daily basis. Call me timid, old school or whatever, but spending 3 hours staring down the barrel of that gun does not seem wise. There was a day . . . not many years ago when you rarely or ever saw an up-track on the face of Superior. Here's the issue: 1) Someone from the top is most likely not able to see parties ascending. 2) Holding up parties at the top while waiting for 3 separate parties to summit is not practical (granted the parties at the top should have a contingency). The east ridge is beautiful and much safer for travel for all those concerned. Those that do climb the face should take full responsibility for whatever happens to them on their ascent. The problem is though, good people may have to live with the fact that their manageable sluff/slide on a descent injured or killed parties on an ascent irregardless that they had no idea that there were people below. For me, there are way too many folks chasing that line and you may never find me on the south face again. Maybe (re) establishing some generally accepted approach paths on some of the trade routes would be wise. At least let's end the practice of booting up shots like Superior. Choose your routes wisely people!